Kitchen transformation: This room was a priority for the client, who found that the cabinets and counters easily got overwhelmed with items. We talked about what worked and didn't work in the space, and then moved through each cabinet sorting, purging and putting similar items together. The pantry was another challenging area. As in many new homes, the pantry had pull out shelves, but with shallow sides. Food often spilled over or was lost in the back. The simple addition of clear plastic shoe boxes on the shelves alleviated the issue, and we could keep categories of food together. The living room was next. The clients wanted to make this room a more grown up space, so we cleared out the majority of the toys (see toy room below) and hung a some of the client's favorite artwork. Since the living room opened into the kitchen we wanted to keep some toys in the space to occupy the kids while their parents fixed dinner. The addition of open bins in the corner for toys and books allowed the kids to easily find and put away their things. 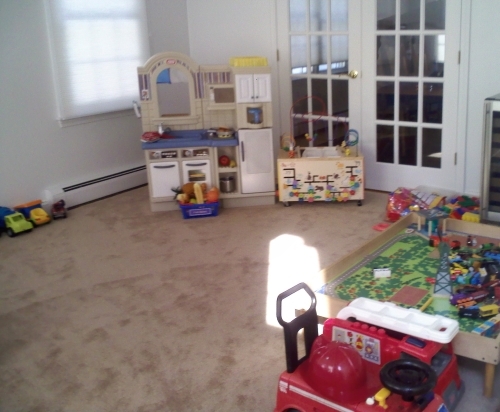 We didn't get a "before" photo of the playroom but these photos show the after. Before becoming a fun and functional play room, this space was a catch-all for items that were in transit: things to donate, things to put in the basement or attic, and things that didn't yet have a place to go in the home. We often have spaces like this, and the key to addressing the disorganization is to give the room a purpose. Once we labeled it the "play room" it was clear what belonged in the space and what didn't. These clients were highly motivated to weed out and donate items, and created a great room for their kids that is the envy of the neighborhood. Can Getting Organized Save you Money? This project shows how organizing can save clients money. When I first met these clients they rented two storage units each month, and their goal was to go downsize enough to only need one unit. Working together we met that goal, and they saw the savings immediately: only one storage unit rental payment per month. After seeing how well that worked, they set a new goal: get rid of the storage unit completely. It took a while but over time these clients sorted, donated, and sold all that they no longer wanted. There were still a few items to figure out, but the clients decided there wasn't enough to keep the unit. 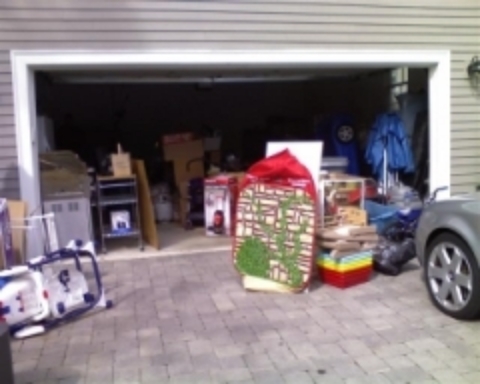 They stopped paying for storage and moved the remaining items to the garage. This worked for a while, but with winter on the way the clients set a new goal: clear the garage and park the cars inside. We worked again on sorting, weeding out and donating/selling what they could. The clear goal - park the cars inside - really motivated the clients to make some difficult decisions. They were thrilled to be able to use the garage again. From two storage units to one. From one unit to none. From a full garage to a usable garage. The organizing paid for itself.